Being white in China, especially in off-the-beaten path areas of China, seems to make it fair game for any stranger to ask you any question about America. This can sometimes be awkward or weird, especially if you are a white person from Sweden, Canada, Australia, South Africa…but I digress. Many people end up asking the same questions (Are you used to the food here? Are cars cheaper in America? Do you teach English? If so, can you start this Saturday?) but there have been a few standout queries over the years. Here are the weirdest questions I’ve gotten, in no particular order, along with a pair of answers: what my snarky self was really hoping I’d answer, and what my polite self actually answered. 1. Does America have mountains? 2. Are your kids yawning because it’s the middle of the night in the U.S.? 3. Did you perm your baby’s eyelashes? 4. Do you eat hamburgers three meals a day, every day? 5. Is California the state that’s next to Australia? 6. In America, you greet each other in Chinese, but backwards, right? 7. Don’t Americans lock their old people away instead of taking care of them? 8. You’re tall because your parents fed you Western formula as an infant, right? 9. How do you get your skin so white? 10. Do all American women wear bright red lipstick? To be fair, most people asked pretty normal questions, and many asked rather intelligent questions about us, our family, and our home country. 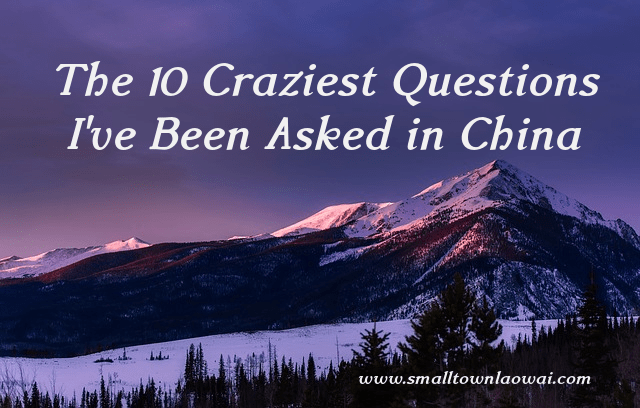 (And full disclosure: I’ve also had Americans ask me some pretty crazy questions about China.) But hey, where’s the fun in normal? Sign up to get my latest post! #6 is Hilarious!!! Never heard that one before!!! hahahaha!!! We were cracking up at these Q & A’s; actually mostly just the snarky A’s! Oh, ouch, my aching sides! I can imagine you hearing every one of those, and I’ve been asked some weird questions about China, too. The weirdest thing that happened to me in China was in a restroom at the Great Wall, low walls between “stalls”of the squatty potties, and the lady next to me looked over the wall, I guess to see what kind of underwear we roundeyes wear! Oh, puh-leeze can we have some privacy when we’re over the trench???!!! Oh thank you, as usual! I always get such a kick out of these! I love that there was a person in China who thought that we greeted each other in backwards Chinese. Did you leave their illusion in tact? The strangest questions I’ve ever gotten are the very few times I’ve been asked what language we speak in America? (Meiguohua? Like, what is my native language as opposed to the English we all speak to communicate with each other, I guess.) And once when someone said, “Wow, I didn’t know America had such white people.” I mean, I guess he could have meant that I took whiteness to a whole new level, but I don’t think I’m THAT pasty. He seemed genuinely surprised to know there were white people at all in America. I tried explaining that it was “howdy” but I don’t think the person was convinced. He was sure it was “hao ni.” Yup, all those Old West cowboys spoke mangled Mandarin. What in the world?!? That cracked me up! Oh, wow. That last one is a doozy of a question! This is hilarious. A fun read. Also read the post about ‘things that exploded in America while you were overseas’. You have a great writing style. Found your blog via takingroute.net, love their podcasts. Thank you so much! I’m really glad you have enjoyed the posts. The Taking Route podcasts are awesome!